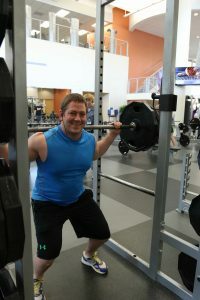 Matt Bitterman works out at the DAHLC on a daily basis, so we decided to feature him as our member success to discover what drives his commitment. “Believe it or not, I used to be a big runner,” recalls Matt, who can always be spotted in the weight lifting area. One morning, however, he saw some guys lifting and thought it looked fun, so he decided to try it out for himself. He loved it and started making lifting his primary workout. Matt says that his biggest hurdle in staying committed was himself. He left work feeling drained and wanting to relax at home, but he realized how much better he felt when he began exercising during the day to break up the work routine. By burning off his excess energy, Matt says he concentrates better at work, sleeps better at night, and has a better sense of self-esteem. Matt has appreciated the help and encouragement from his YMCA back home and now to the staff and fellow members at the DAHLC. He even recalled a time when one of our wellness coaches, Anthony, helped demonstrate a new exercise, which has improved Matt’s lifting routine. As Matt says, “You can’t get that from a YouTube video.” In addition, Matt now has a 6 month old and is increasingly aware of taking care of himself so that he can take care of his family. Don’t think that you won’t fit in or people will stare, critique or make fun of you. Everybody is too busy doing their own thing to notice or judge you. Everybody goes through injuries. Take time to heal properly, and listen to your body as it will shorten the time you have to spend out of the gym. Thank you, Matt! We love your dedication to the DAHLC and to your health!